Our sparkle ball cat toy was such a hit we thought we would offer an even BIGGER sparkle ball! 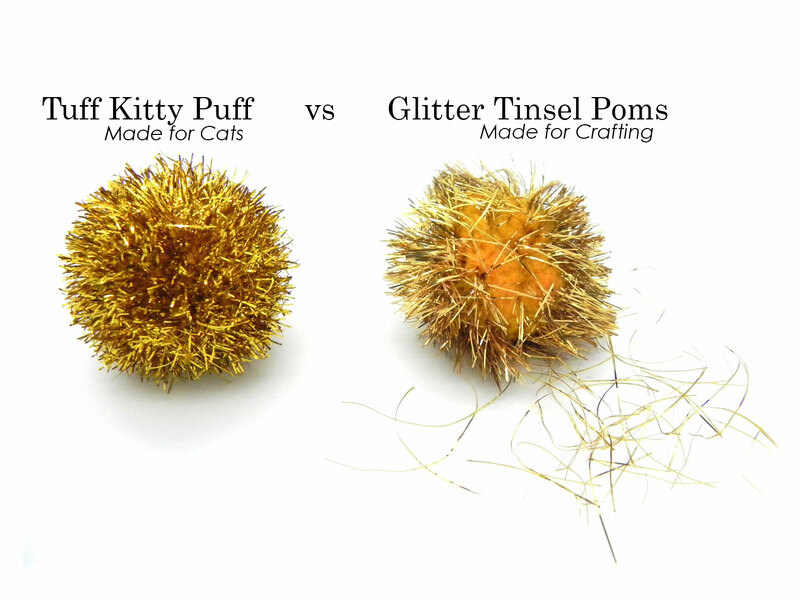 Introduce the Jumbo Tuff Kitty Puff® Sparkle Ball Cat Toy! The Jumbo Tuff Kitty Puff® comes in the same great assorted colors: Green, Blue, White, Gold, Red and Pink. These sparkle balls are over 2 inches in diameter. They still consist of tinsel intertwined with yarn and very tightly woven into a soft but firm light weight fabric ball. 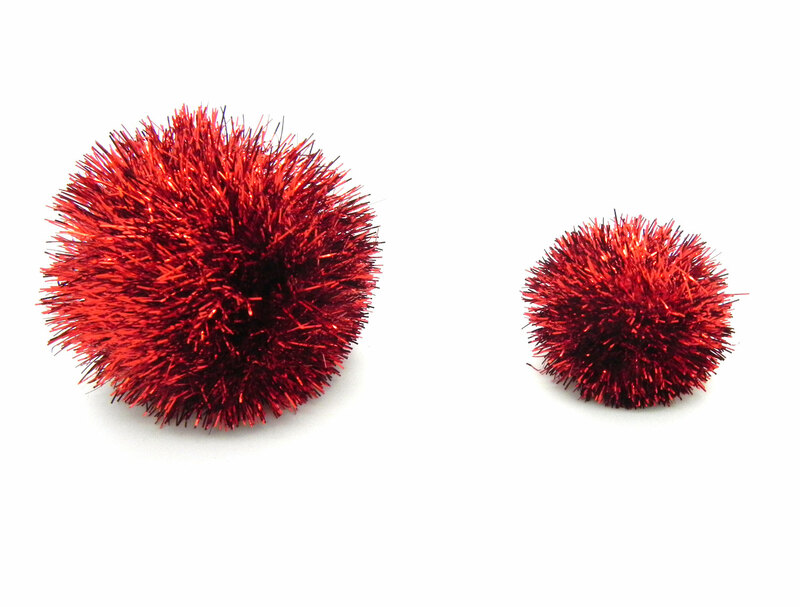 Our Jumbo Tuff Kitty Puffs® or sparkle balls as we call them, can be called glitter balls, tinsel balls, glitter pom poms, tinsel pom poms. No matter what they are called your cat will love to toss, chase, bat these cat toys around. Because of their size there is less of a risk of your cat accidentally swallowing these toys. Get involved with your cat's exercise and tie a string around one of these large sparkle balls and have your cat chase it. These sparkle balls are a great addition to your cats toy selection. We even have heard that they like one color over another! We have three cats and by far their most favorite toys are Sparkle Balls. We purchased the Jumbo ones and they are very durable. They are great toys and we definitely recommend them. by far the best sparkle balls! These are better quality and more enticing for my kitty than any other sparkle balls I've ever bought. I went on the hunt for them by google searching and lucked out to find this place and these toys! My kitty is so very tickled with them. And I love that the sparkles are staying with the ball, making the toy safer and longer-lasting. Cats love them some sparkly ball! My two cats love the sparkly balls... They bat them around and some times it gets caught on their paws and then flings in a random direction - which seems to add to their fun. Great toy! My cat is finally interested in playing again! I first purchased this product at Christmas time as a treat for our 11year old indoor cat, he had appeared to have lost interest in his toys, and he has plenty which I kept rotating in a attempt to get him going again. Well, since I purchased the fist bag of Sparkle Ball Cat Toys he has a new lease on life again. I find them all over the house and because I can't always find where he has hidden them I have had to buy some back ups! Greatest toy for any cat! My cat loves anything shiny, particularly sparkle balls. The smaller ones he ended up eating, so we got the next size up, and he would somehow completely flaten them within a couple hours. I decided to get the largest size I could find. They work great. He loves to play fetch with them, and they hold up very well too. It's been 2 weeks and he hasn't found a way to destroy them yet. It's nice to let my cat actually play with a toy and not having to worry about him eating it. I purchased these toys for my personal cats and they are the favorite of all the favorites! I volunteer at my local animal shelter and purchased a lot for the shelter cats. Aside from the fact they enjoy them very much, they are of a good size to not slip through the cage bars and get lost. I'll buy more as needed!! My little kitty LOVES these sparkly balls ... he will literally entertain himself for hours at a time running all over the house with one! He loves it so much, he even puts it on his food dish after he has his wet food ... as if both it and his food are his favorite treasures!